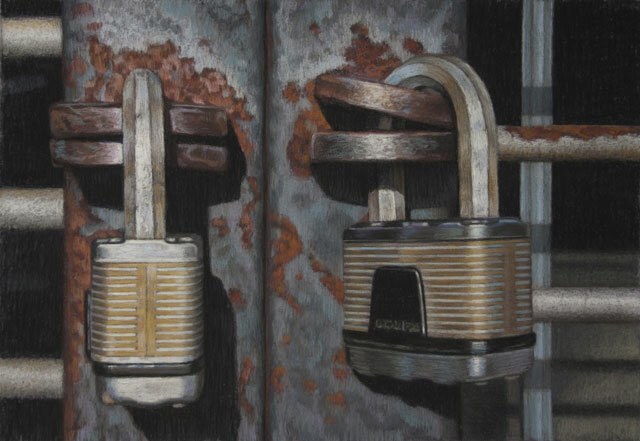 Locked is a pastel drawing by full-time Art Dept. faculty member, Tom Brenner. Bridgeport, CT...Students of Housatonic Community College and the general public are invited to see the work of the HCC Art Department faculty firsthand during the annual faculty show entitled (A)Muse which will run from April 7-25 in the Burt Chernow Galleries of the Housatonic Museum of Art, 900 Lafayette Blvd, Bridgeport, CT with an opening reception free and open to the public, Tuesday, April 8, 5:30-6:30 PM.